There are so many beautiful WordPress themes to check out, that it’s easy to get swept away by the ones that look awesome, but might not be functionally great. That’s why investing time into the best blog templates can pay off at the end of the day. But first, define your niche. Once you picked a niche that you care about, you can give your blog a voice and your take on things. Your niche can be defined by geographical areas, a specialty industry, ethnic or age groups, or any other particular group of people. So, take some passion, a little time and effort, and start your blog today. Today, the best thing you can do is to give these best blog templates a try. Whatever WP template you will come up with, use it to your full advantage. Set your blog up with interactivity to encourage people to stay with you longer. As a result, your blog becomes more SEO-friendly, which is of ample importance. So, what are you waiting for? Make your choice and get started with your blog today. 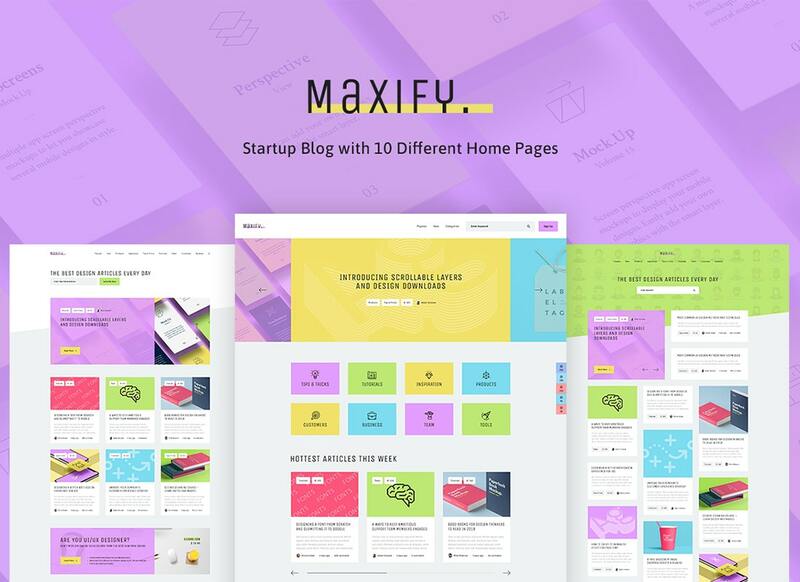 Maxify WordPress theme doesn’t look like common web design for startups and business projects. 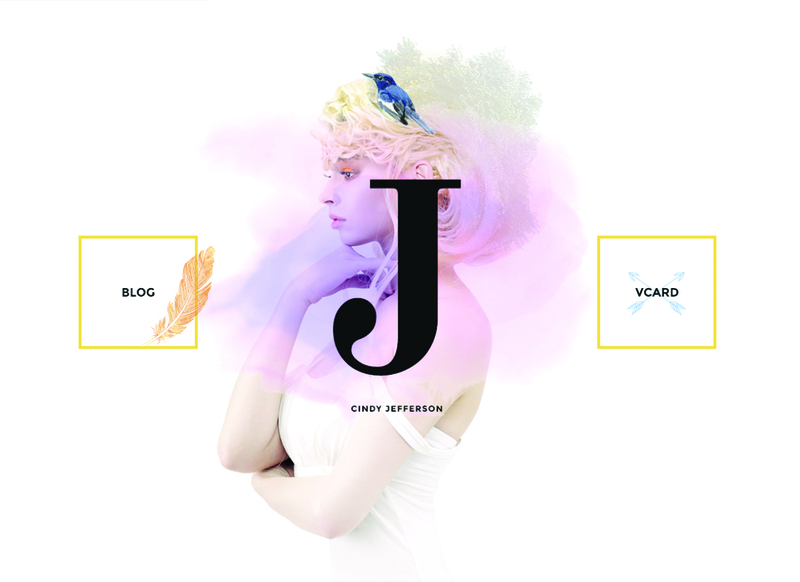 It features a bold, elegant, and stylish layout created in soft pastel colors. It’s apt for both personal and startup blogs. It can become a solid foundation for a range of content-rich sites like niche blogs, newspapers, online magazines, reviews sites, etc. The theme is fully compatible with WordPress 5.0, Gutenberg, and the latest GDPR demands. It’s integrated with Elementor page builder that lets you customize the theme’s layout in the intuitive drag-and-drop mode. It also supports a number of popular WordPress plugins, including Social Pug, Instagram Feed, MailChimp, and Essential Grid. When you don’t have a well-known, established brand, content can help you create awareness. With Trendion, it's easy to start a blog great out of the gate. As a result, you can build your brand and spread it to the people that are most interested in it. 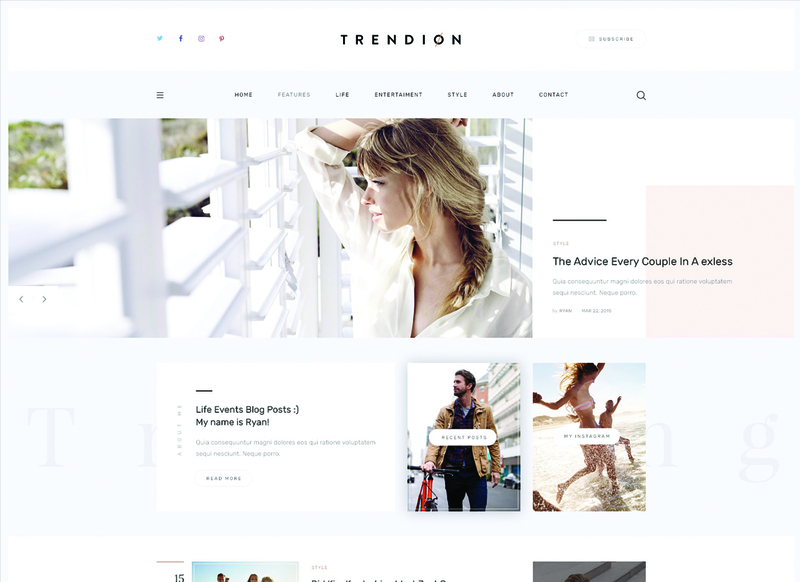 No matter what niche you are in - healthy lifestyle, news media or fashion - Trendion is a great solution right off the bat. Responsive, clean and attractive, it can help keep your readers up to date on your activities and strategies. Waste no time on bothering with code, instead, create unique layouts hassle-free. Help your blog stay highly ranked in search engine results with SEO-friendly Trendion. Without a doubt, the best thing to do on your blog is to provide expert opinion on things you know the best. 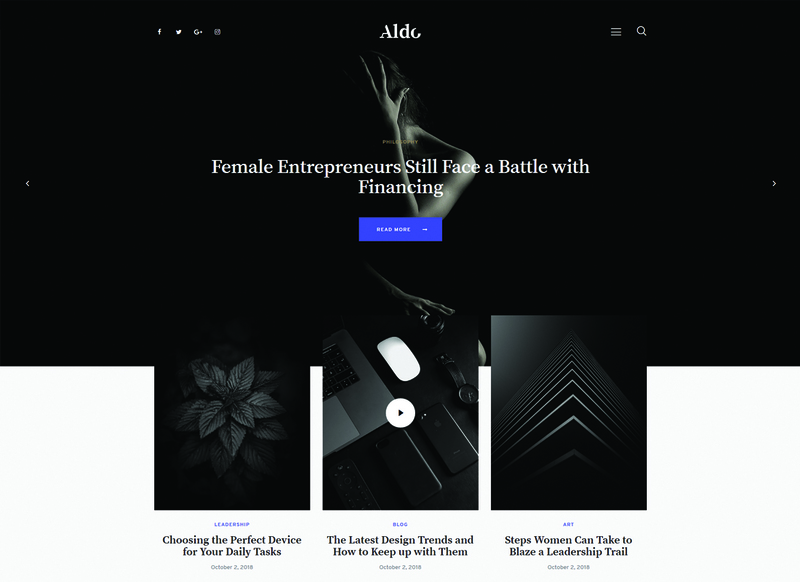 Compatible with WordPress 5.0, Aldo is one of the best blog templates up to date. 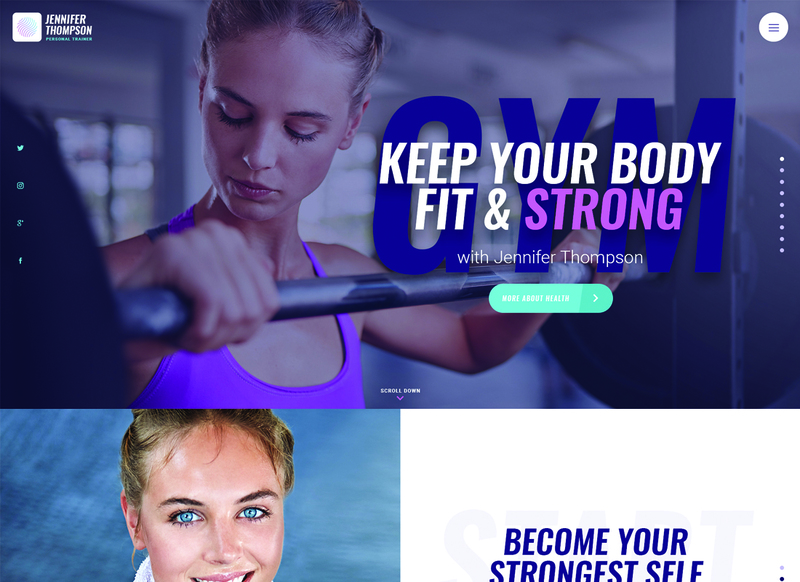 Its clean, neat and mobile-friendly layout fits tutorial, industry, quizzes, case studies, and other topic related websites. The best thing is that you can poke around Gutenberg editor and take advantage of multiple blocks & theme shortcodes. Drive more traffic to your modern blog that looks awesomely no matter what device your user is on. At last, compatibility with Contact Form 7 maximizes your chances to increase the number of your subscribers big times. With Gutentype, it's easy to start a blog that can help you solidify your brand voice. What's more, it can help demonstrate your values and create original content that your various audiences can relate to. Besides, it allows you to enhance your selling spree even if haven't sold a thing yet. WooCommerce integration can help make your dreams a reality. Based on the powerful framework, Gutentype adjusts perfectly to any modern device. Make the best use of its pre-built pages to make sure your blog looks unique and more personalized. What type of skin do you prefer - black or white? Go ahead, get creative with Gutentype right away. In such a crowded space, it's very important that your blog can separate itself from the competition. The best way to achieve that is to give Avventure a try. 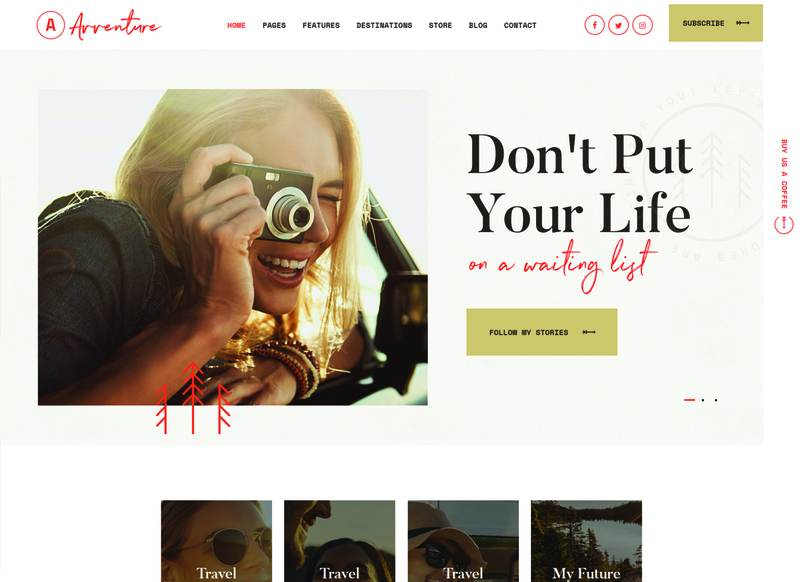 Built with Elementor page builder, Avventure beats the heck out of the best blog templates out there. Indeed, it supports a big number of diverse blog layouts and has extra fast page load to help you drive more traffic to your site. 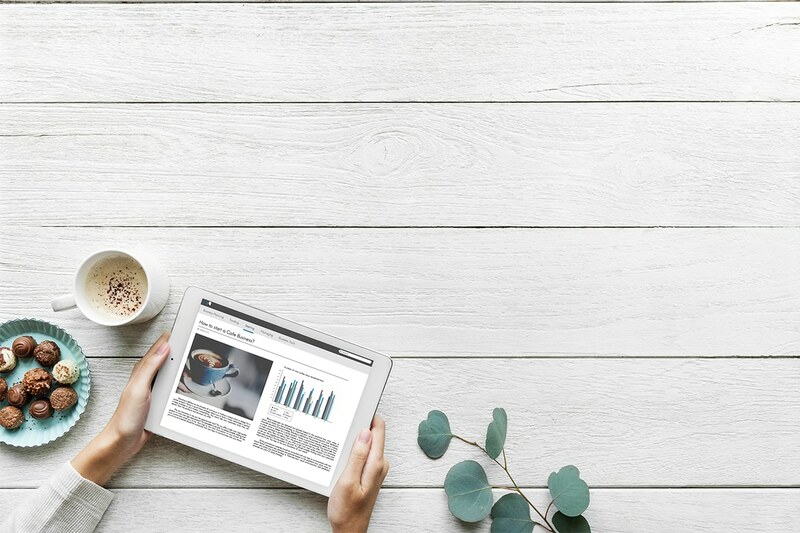 It's easy to get creative with Avventure thanks to plenty of pre-made homepages, modules, and shortcodes that can be used to get your goals accomplished. Did we mention its WooCommerce ready? Get focused on the solution that is right for you. As a blogger, you have a laundry list of goals, big and small, right? Get your blog and your business to where you want it to be with Vagabonds. Attractive, modern and responsive, Vagabonds can catch every user's eye for sure. Perfect for personal, lifestyle and travel blogs, Vagabonds has a lot ou to offer. So, you can easily create new unique layouts, and display your exceptional projects in awesome grids. Make your website more interactive by poking around custom shortcodes & widgets. Apart from that, start selling just about anything and receive donations thanks to Give - Donation plugin. Enjoy its live demo before purchase. 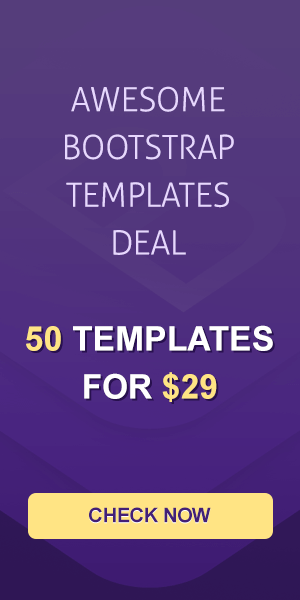 The secret to getting started is picking one of the best blog templates available. Go ahead and make it happen with ShiftCV. This contemporary WP template combines a simple and clean design with a fresh and colorful display solution. 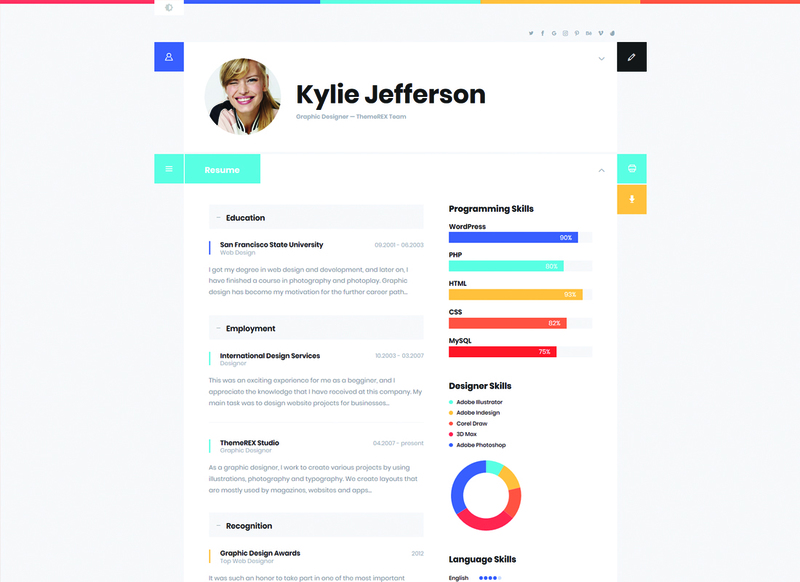 ShiftCV suits great CV, Vcards, resumes, personal blogs, creative agencies or photographer portfolios. In fact, thanks to a whole host of versatile customization options developing the website that fits your particular needs becomes a smooth track. Pay heed to the right blog article content as it can help you stand out from the competition. At last, GDPR compliant, ShiftCV can help put your best feet forward. Blogging can be a daunting activity if you're just starting out. Yet, don't fret, with Bazinga, you can prepare for success. 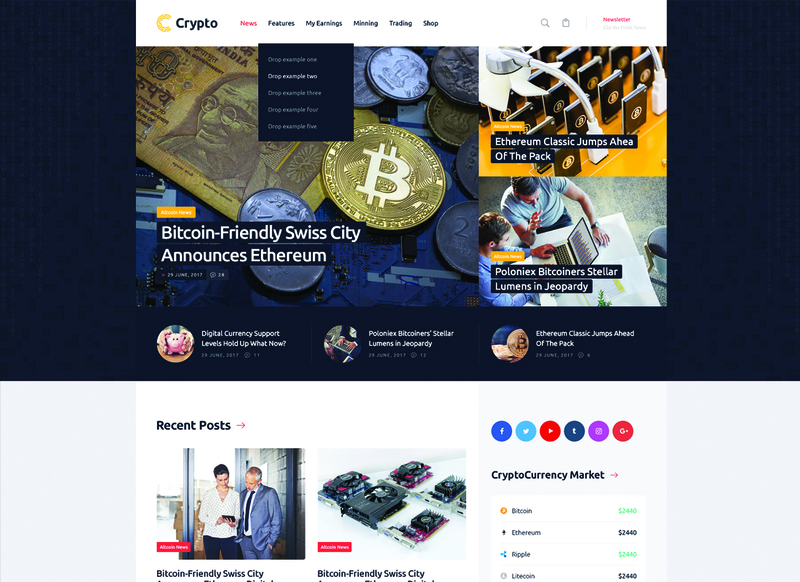 Attractive, fresh & trendy, Bazinga is a go-to tool for niche blogs, how-to blogs, giveaways, business and cryptocurrency websites. Its minimalist design will look correctly across all modern screen resolutions. Make a compelling case to market your brand effectively. Let your users enjoy a great website with beautiful design and intuitive navigation. Besides, it makes sense to make the best use of ThemeREX Add-ons plugin. Nothing can stop you from making it big in sales even if you haven't sold a thing yet. Do you plan to start a blog to illustrate your skills or expertise in a particular niche? Great, give Buzz Stone a shot. Crafted with care, it fits niche blogs, infographics, finance, parenting or entertaining websites. Find the right design that fits your blog niche and at the end of the day, it will result in sales. Besides, tons of eCommerce options allow you to maximize your selling spree big times. At this point, Buzz Stone is easy to install, edit and customize thanks to a plethora of built-in features and options. One thing to remember is that WPBakery page builder can ease your developing pet peeve from day one. If you plan to start a crafting blog, then it may need to be direct, fun, and personal. More important is that every successful blog is unique. That's why picking one of the best blog templates that can make a difference in your blogging is vital. Melania is just the thing if you want to become a global player. 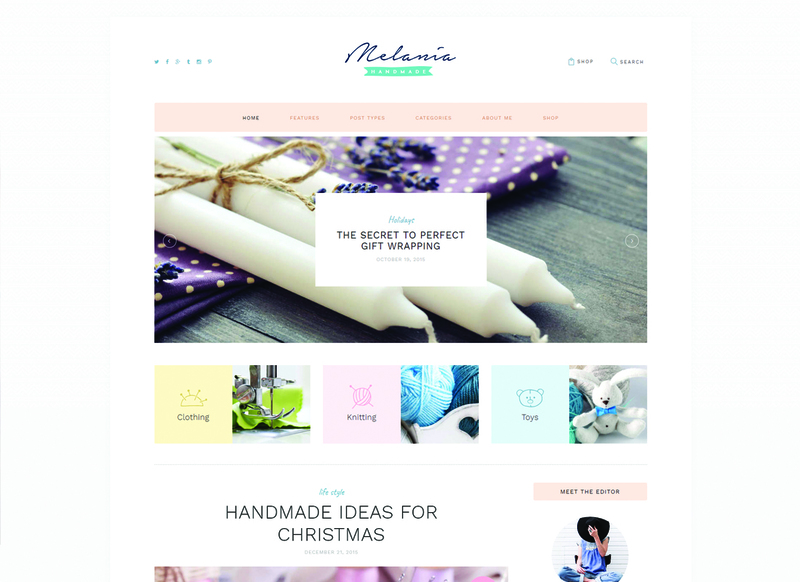 Designed to match the needs of homemade clothing or handcrafted toys, Melania comes with a number of diverse blog post layouts. Take advantage of WooCommerce integration to help make your money keep coming in. No matter how you slice it, promote your products or services through social media. All in all, that will work for you. Don’t be afraid of starting your blog – just do it. The best thing is that Rosalinda is your greatest ally in achieving that. Attractive, clean and trendy, Rosalinda should be high on your list. Tons of advanced features and customization options allow you to build a blog that your users have never visited before. The better you get at it, the better you will be able to find your own visual voice. As a result, you can create unique layouts, add more interactivity to your site and write contents that will grow in leaps and bounds. Besides, compatibility with Booked Appointments plugin allows you to manage your appointments online hassle-free. When you start a blog no one will know about it until the very first comment. It’s a time for you to discover Marcell. Once you decide to go for it, Marcell can help you become a sensation. Enjoy its 20 homepage styles to find the right one for your blog niche. 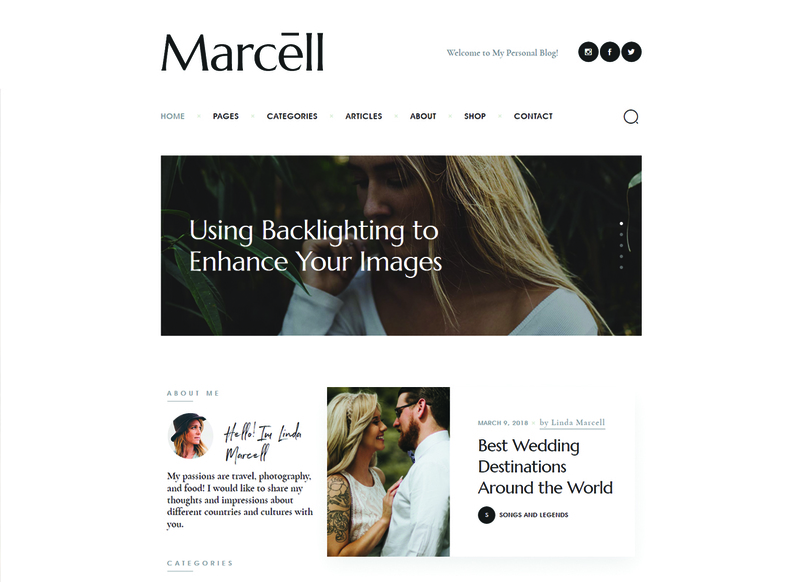 Take time to explore the power of Marcell, it’s a chance figure out what sort of things you want to make and blog about. Built with Elementor page builder, it puts power in your hands to get ahead of the competition. Tell your story, display your projects in awesome grids, do everything in your power to get noticed. At last, it's never to early to enhance your selling spree with WooCommerce plugin. You may have the best product or service possible in your niche, but if your blog looks lousy, your online business is doomed. So, don't take these risks. 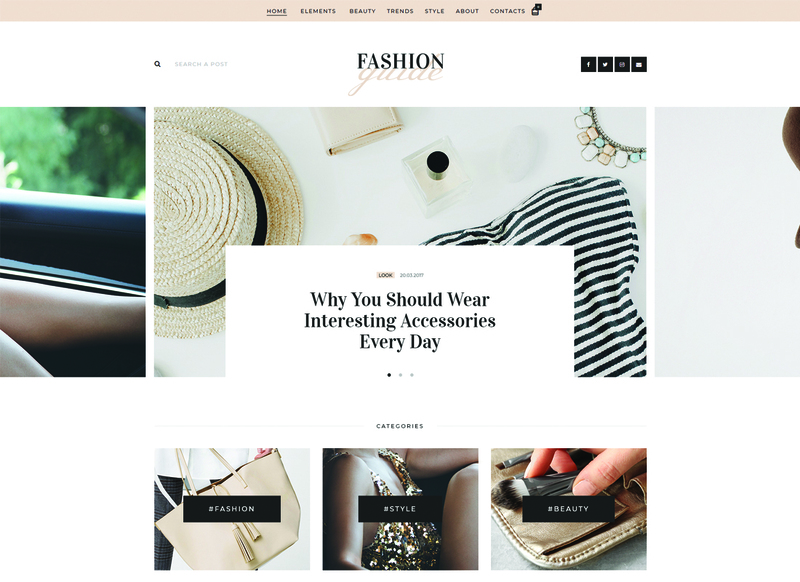 Invest in one of the best blog templates - Fashion Guide - and see how successful your blog can become with it. 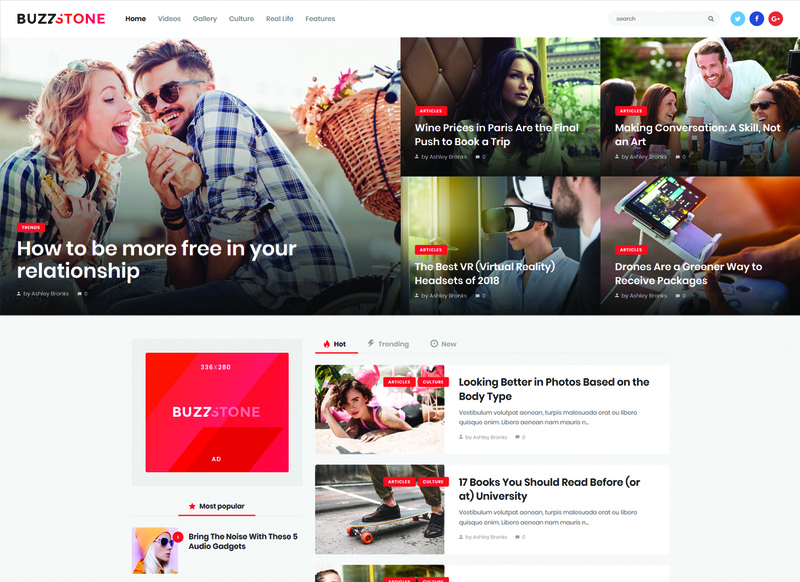 Once you go with Fashion Guide, its clean and eye-catching design, wonderful content and beautiful galleries will charm your every user's eye. The best thing is that it's WordPress 5.0 compatible meaning that your blog is ready for the future right from the start. Finally, use MailChimp support to your full advantage to increase the number of your subscribers big times. Starting a blog is one of the best ways to put yourself out there and drive traffic. 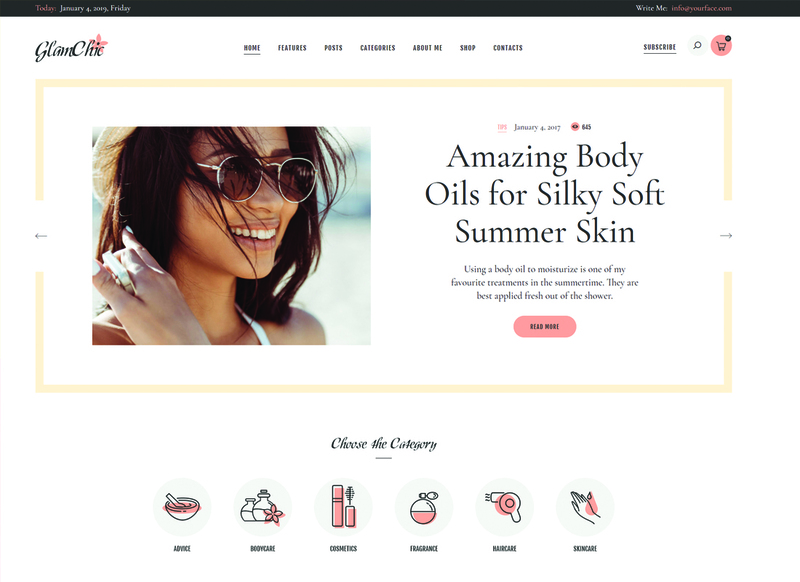 Whether you’re trying to build a freelance business, launch a personal brand, or write about fashion, it's hard to find WP template that does a better job than S.King. Built for contemporary personal stylist & lifestyle bloggers, S.King beats the heck out of all the best blog templates out there. Optimized to work with a set of premium plugins like Slider Revolution, Essential Grid and Events Calendar, it’s now easier than ever to get started with writing and publishing online. Besides, WooCommerce integration can help you generate profit from it. In order to get you started down the right path with building a healthy blog, choosing the right WP template can save you a bundle. Nice, modern and clean, Healthy Living Blog is one of the best investments you can make early on as you’re trying to attract more readers. 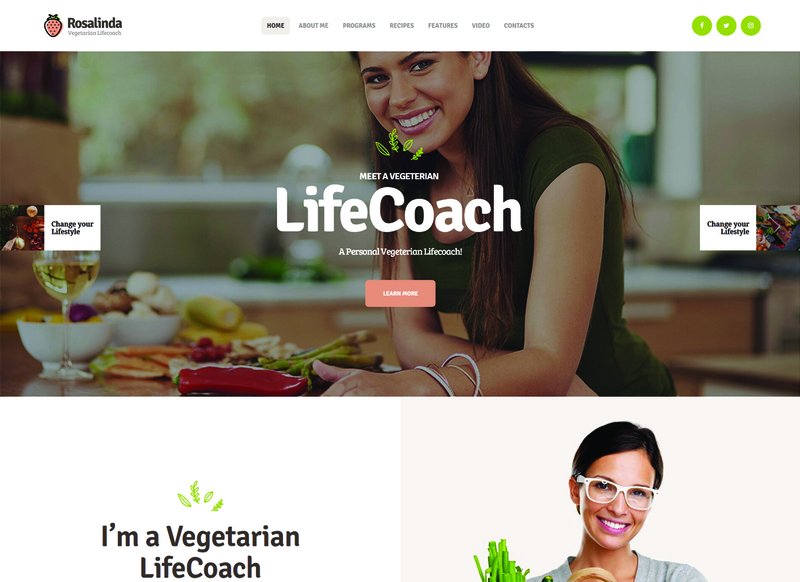 It fits healthy living blogs, food bloggers, dietologists or travel websites. Compatibility with WPBakery page builder eases your developing pain from day one. Thus, you can easily create new unique layouts that are great out of the gate. Let your readers leave comments that will be displayed in an impressive and engaging way. So, go ahead and try a quick and easy way to start your own blog. Learn how to start a successful blog for your business with Wonderer. This modern, responsive and attractive specimen of the best blog templates is worth your attention for sure. In fact, no matter what niche you are in, starting a travel or entertainment blog becomes a smooth track. Compatibility with UberMenu can help big times when displaying your contents in a more attractive manner. Want to take your blog into the heart of a new culture? Great, Wonderer supports multiple languages. At last, explore its diverse blog layouts, modules and shortcodes. Then, give Wonderer a try. Looking for ideas to express yourself by sharing your knowledge, thoughts, passions, and viewpoints? 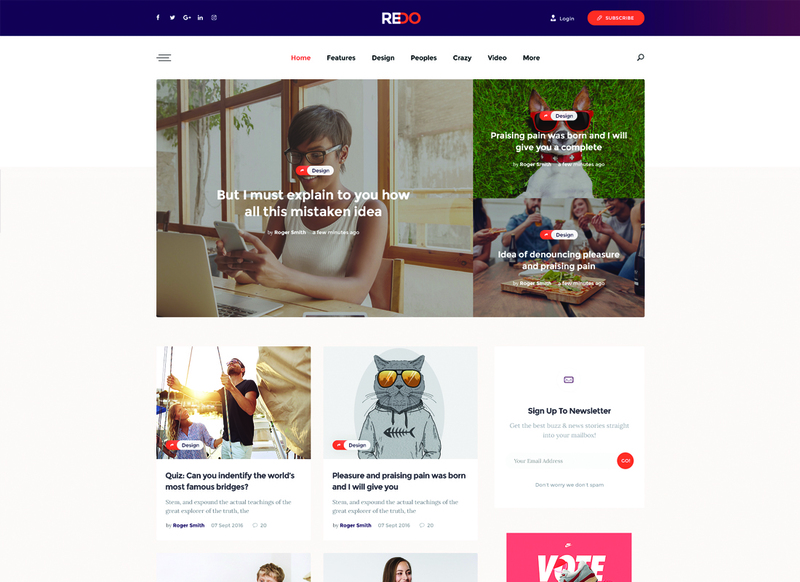 Start your own blog with Redo and make it anything you want it to be. Easy to install, edit and customize, Redo allows you to build a blog that is interesting, interactive, and consistent. GDPR compliant, Gutenberg ready, responsive, well, what more could you ask for? Compatibility with Instagram Feed and MailChimp gives you a great way to connect with other people, subscribe to your news. Indeed, try your hand at creating new unique layouts with WPBakery page builder. As a result, you can add a fresh coat of paint to your blog hassle-free. You can start a successful mom blog in just a few minutes! Did you know that? Give Mamita a shot right away. Compatible with WordPress 5.0, your pregnancy, maternity or parenting blog is ready for the future. Even if you're just starting out, WPBakery page builder can help bridge your gap in coding knowledge. Thus, it's easy to take control over your website, create extra layouts, display your projects in awesome grids and spice up your blog to the most. Let your readers enjoy your absolutely engaging blog across all modern screen resolutions without a hitch. What's more important, give them the ability to find what they are looking for thanks to the interactive Ajax search. If you need a boost of creativity to get started with your own blog, Femme is your greatest ally. Give your blog a voice. Use it to inform, educate, and inspire other people in order to make the world a better place. 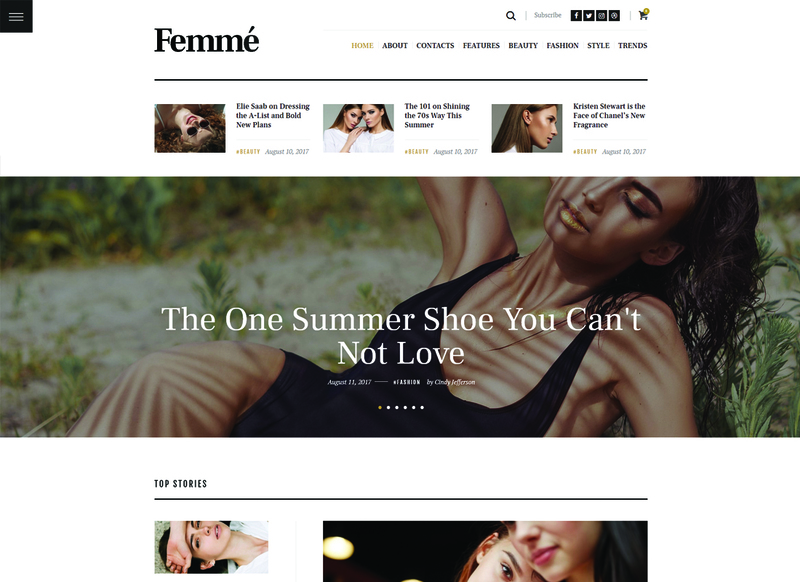 Femme is one of the best blog templates crafted for lifestyle magazines and fashion bloggers. 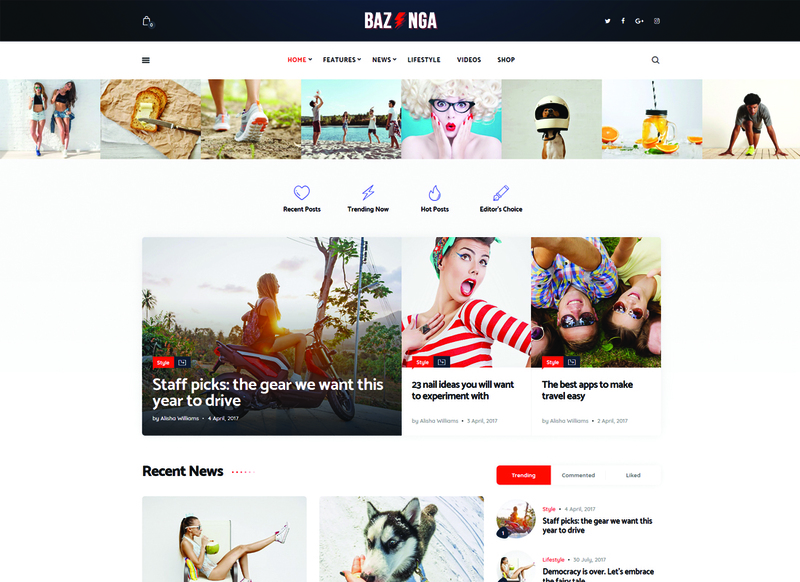 Its clean, neat and responsive design fits creative projects, healthy lifestyle blogs and news portals at the start. Use your blog as a platform to promote your own products, services or good causes. Without a doubt, you and your bottom line will be glad you took advantage of WooCommerce plugin. Ready to stand out? Here’s another one great solution for your future blog. 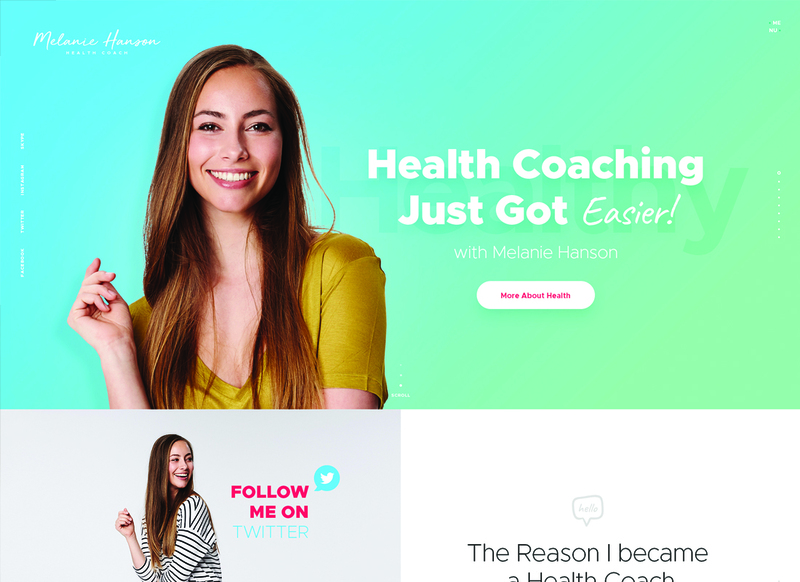 Designed to fit the needs of health coaches, nutritionists, and lifestyle bloggers, Melanie Hanson has a lot you to offer. Promote your business by sharing your passion with the world. Teach others about what you know and they will vote for you with their money. Even if you haven’t sold a thing yet, don’t fret, tons of eCommerce options will ease your pain. Clean, attractive, highly functional and easy to operate with, Melanie Hanson can help you reach the goal. Poke around its custom shortcodes & widgets to add more interactivity to your website. If you want to create a strong presence for your food business online, getting started with a blog is a move in the right direction. 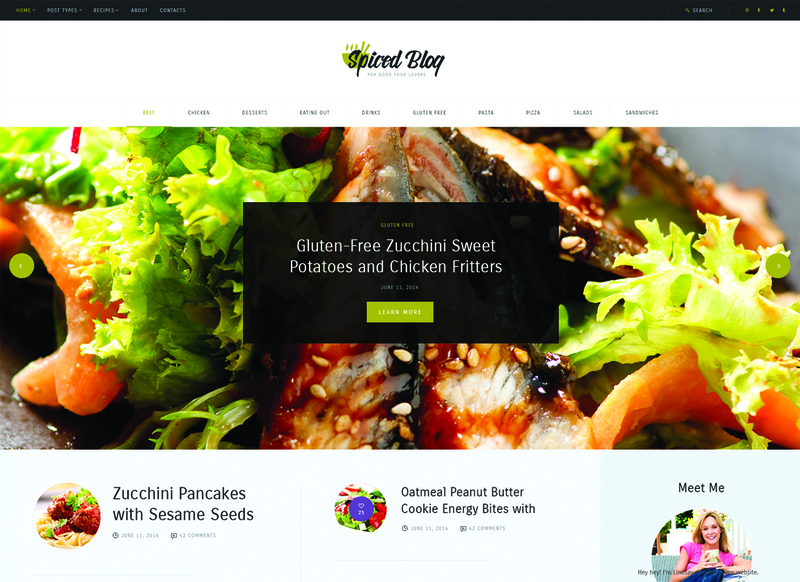 Spiced Blog is a perfect solution for a food blogger, food photographer, chef portfolio or recipes websites. This feature-rich WP template allows you to set up and promote your own blog even with a skill gap. No coding skills are needed to start a blog that looks great out of the gate. Indeed, nothing can stop you from creating new unique layouts that give your website a bit of extra love. Optimized for speedy page load, Spiced Blog will keep our visitors more engaged online. If your goal is to create a profitable blog, then bring Gracioza to your notice. Beautiful, modern and responsive, Gracioza can help make a grade in online presence. It fits online magazine, healthy lifestyle website or sportsmen blog. Compatibility with WordPress 5.0 ensures that your website is up to date with the latest website technology standards. Go ahead, promote your products or services in a clever way. In fact, it’s easy to maximize your sales potential with lots of eCommerce options. 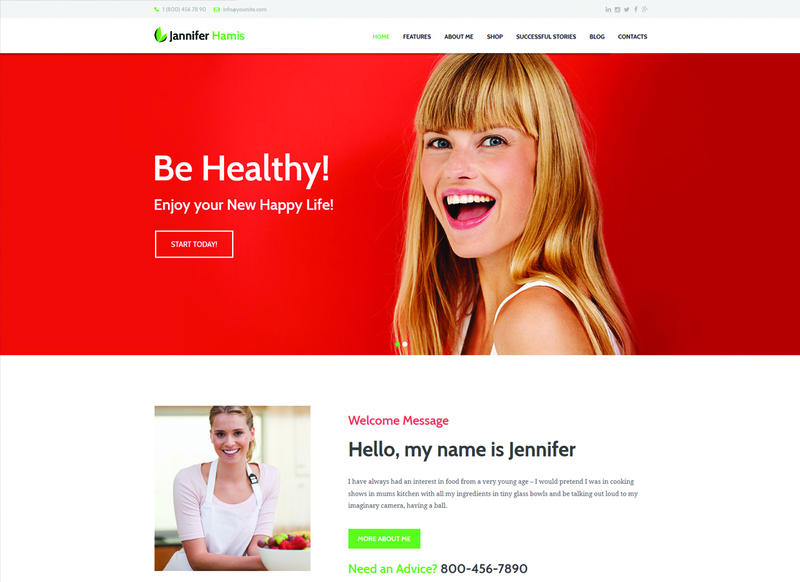 Take time to enjoy a set of pre-made pages, advanced Contact Forms, and attractive galleries. As a result, you can present your blog in a more unique way. It’s clear, the height/weight calculator can go a long way for your business. Looking for ways to make use of your creative skills? Turn your joy for creating art into a profitable business. Start a blog with one of the best blog template out there. 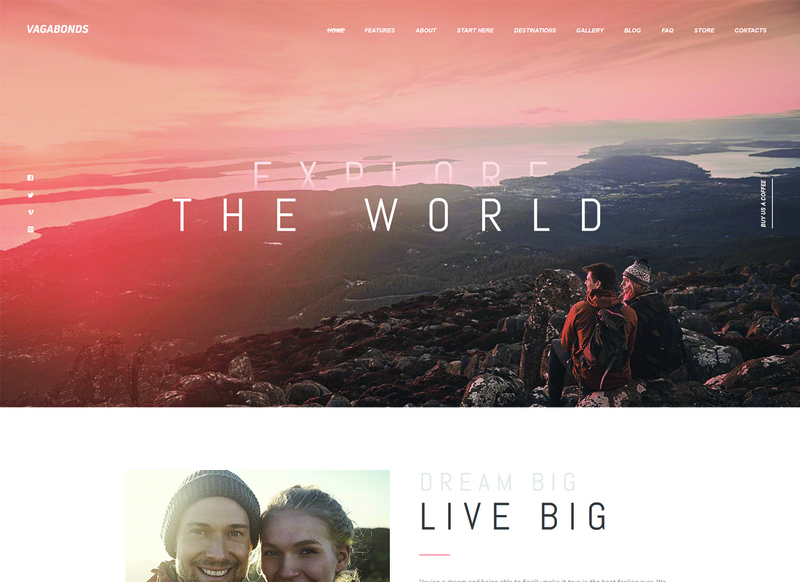 Cindy J. is a vibrant, attractive and creative WP template definitely worth the trouble. Use your blog to share more about who you are, what inspires you, your artistic influences or upcoming projects. Ideal for online magazines, designer & photographer portfolios, & review portals, Cindy J can help push your business forward. It comes with 4 demo layouts and 4 pre-defined color schemes to get creative with it. Take advantage of WPBakery page builder to spice up your blog with versatile layouts. If you’re one of the experts raising alarm bells about cryptocurrency, give your own blog a voice. The best way to achieve that is to give Crypton a shot. You're going to love it. Crafted with care, it beats the heck out of all the best blog templates up to date. Indeed, it fits financial, investment and cryptocurrency businesses at the start. Besides, compatible with crypto plugins, Crypton can help you tap into new markets. Thus, sell your coins, accept donations and payments both in real money and cryptocurrencies hassle-free. Indeed, the multi-currency calculator can go a long way in getting your visitors engaged. Turn your blog into your legacy. Whether you've got a specific goal to reach or just want to lead a healthier life, starting a blog can help. Whether you want to keep a blog to record your fitness goals or chronicle your fashionable treats, Jannifer Hamis fits the bill. Clean, attractive and feature-rich, it eases your developing pain from day one. Forget about coding issues, instead, create new unique layouts easily, even with a skill gap. Got a bestseller to advertise? 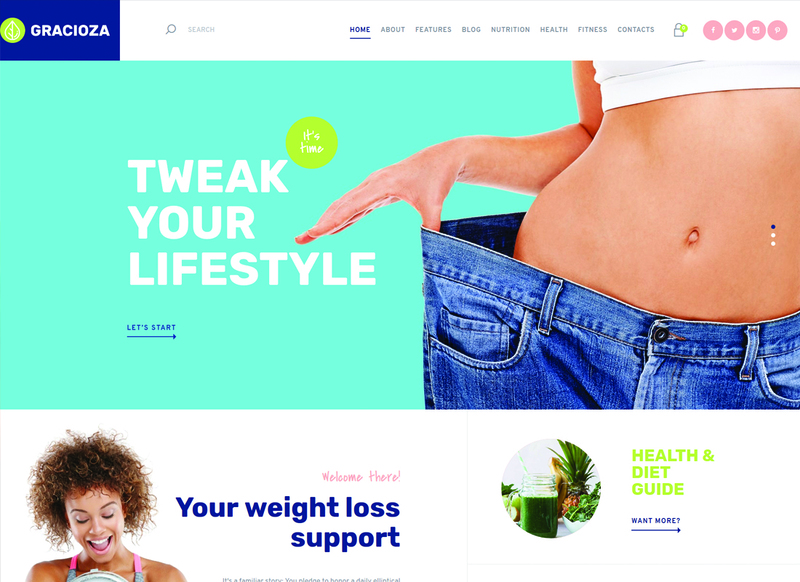 Do it right, promote and sell your healthy products or services with the help of tons of eCommerce options. Also, it makes sense to take advantage of pre-designed pages to make your website look great out of the gate. Want to start a blog but not sure if you're creative enough to take the plunge? Don't fret, with Street Style, that's as simple as that. Thus, it's easy to not only share photos, videos, and write about fashion, but also to connect with other people who share your interests. Try your hand at creating unique layouts even without touching a single line of code. WPBakery page builder can keep your shoulder on the wheel, for sure. Enjoy a set of beautiful blog post styles to promote your fashion blog in a more attractive way. Use high-quality imagery to draw in your visitors and tell the story of your mission. How creative is your potential? Most people think they're pretty creative, but only a few really are. So, if you want to get noticed, turn the spotlight to your personal blog. 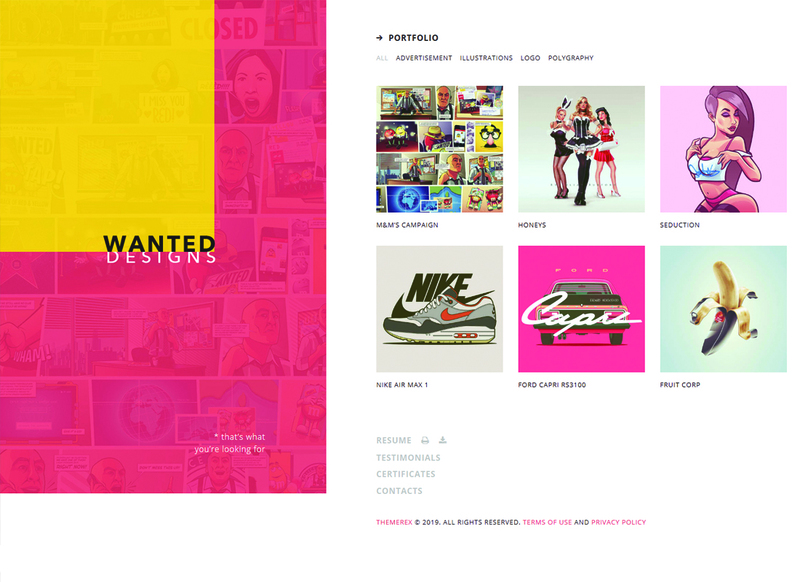 Wanted is one of the best blog templates designed to fit all kinds of modern online & offline portfolios. It comes with 2 unique skins to help show off your personality in a more engaging way. Besides, tons of amazing customization options allow you to showcase your skills, job experience and achievements to build up a network with other creative folks. At last, tell your unique story that can help get you ahead of the competition. If you’re passionate about fashion or anything else for that matter, find a way to express that via your blog. Be about to give GlamChic a go. Elegant, clean and responsive, this specimen of the best blog templates should be high on your list. Pick one of 3 beautiful homepage styles to create a blog that solves the problems of the enormous potential audience. Communication is at the heart of blogging, so it makes sense to make the best use of advanced Contact Forms. Jam-packed with pretty portfolio designs, GlamChic allows you to display your imagery in awesome grids. Test the waters with GlamChic right away. If you want to run a wedding blog, you have to be creative. The best way to achieve that is to get creative with July Morison. 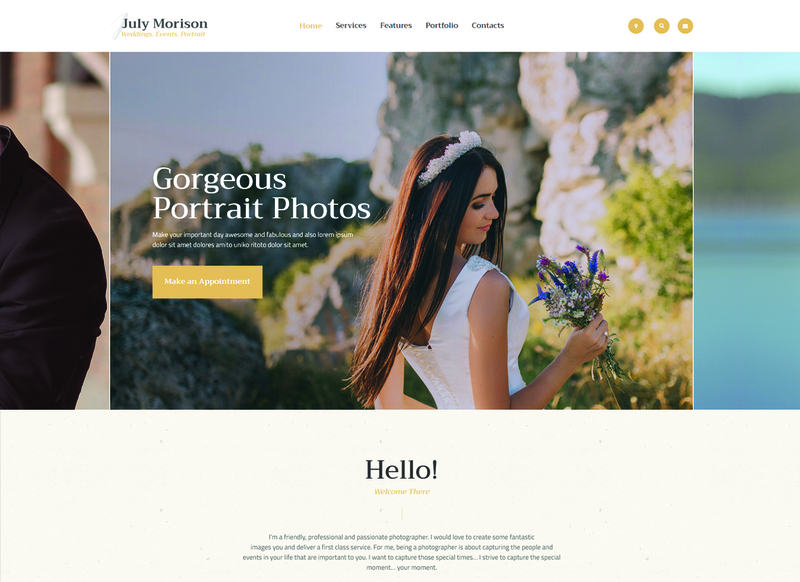 Developed to match the needs of wedding websites, it fits photographer portfolios and personal blogs. 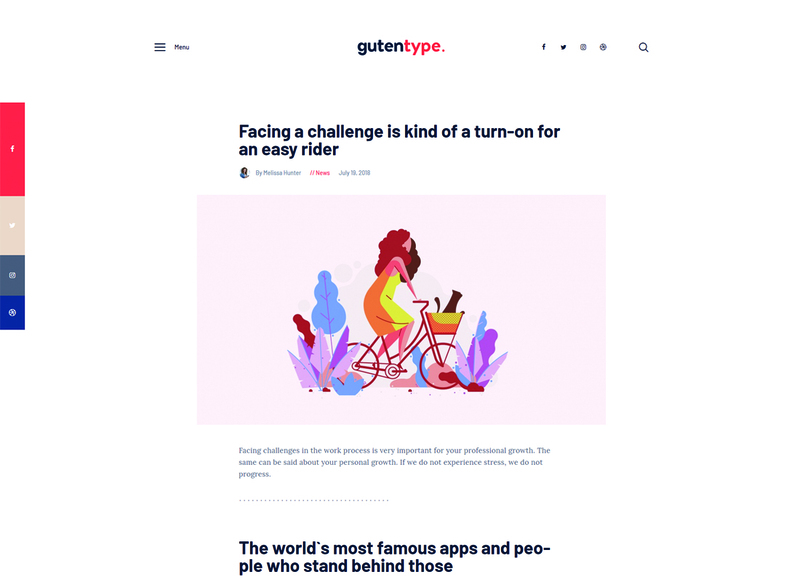 Try your hand at this versatile, elegant and responsive specimen of the best blog templates that can help get you started without a hitch. What's more important, the skill gap shouldn't be a barrier that stops you from building a website. Besides, having the option to sell products or services online is always a good thing. At last, SEO-friendly code of July Morison can help index your blog higher in the search engine results. For some people, starting a specific type of blog can lead to career opportunities and even paid writing gigs. If you're one of them, then investing in Daniel Green makes a whole lot of sense. Be about to start your own blog to showcase your personality, skills and achievements to get noticed. Thanks to 6 beautiful blog styles it's easy to get started and see how successful you can become with it. Got a bestseller to advertise? Great, get ready to sell books, courses or training directly from your website. 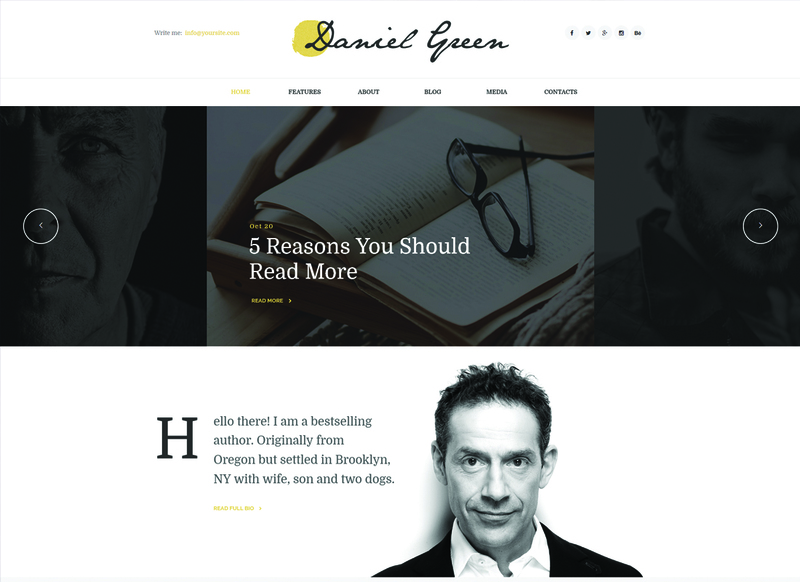 Indeed, responsive from default, Daniel Green makes it easier for your visitors to enjoy your blog on any modern device. If health and fitness is your main passion, then why not share your insights through a blog? Get inspired by Niobe. 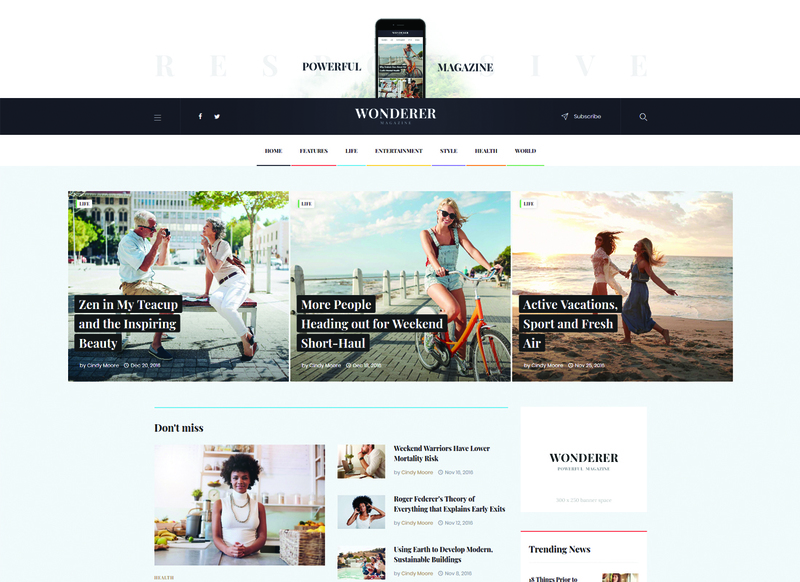 Responsive and trendy, this modern specimen of the best blog templates can keep your blog bang up to date. 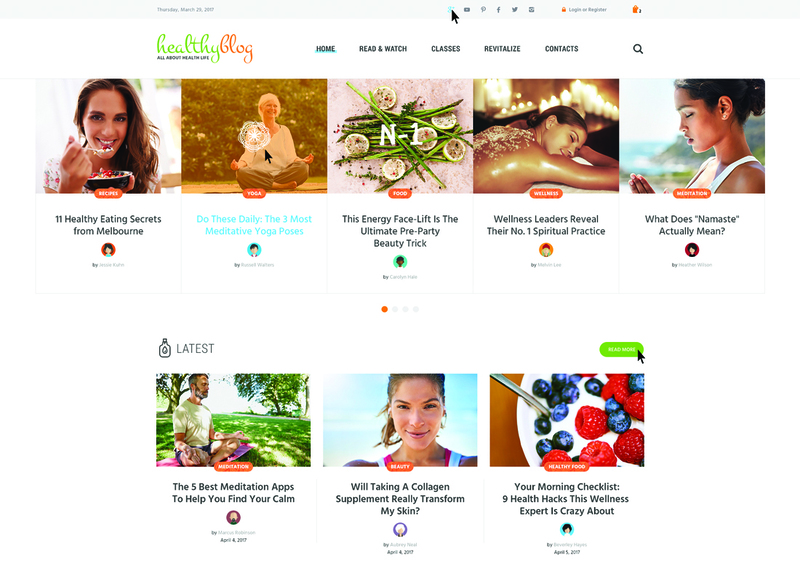 Its clean layout fits contemporary blogs, online magazines, and healthy lifestyle coaches right off the bat. Provide motivation and information that will help your visitors live a longer and happier life. Make your advice more effective by promoting your products or services online. Let your visitors enjoy a hassle-free online buying process. Use Events Calendar to your full advantage. As a result, it will bolster your business in the long run.